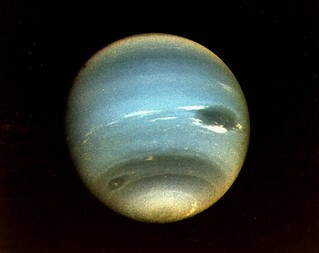 Description (August 25, 1989) Voyager 2 was the first (and, so far, only) spacecraft to fly by the planet Neptune and its two satellites: Triton, the largest, and Nereid. The most obvious feature of the planet is its blue color, the result of methane in the atmosphere. Research continues on Neptune's two largest satellites and the additional six that were discovered by Voyager 2's investigation.